I recently asked the staff of vcleat.com to put article ideas in our office suggestion box. I wasn’t sure I would get any ideas but if I did, perhaps there would be some gold there. When I opened the suggestion box today, I found two article suggestions and pulled them out. Suggestion number one: “Clowns”. Suggestion number two: “Scary Clowns”. I am going to ignore those article suggestion box this week. While the rogue clown situation is worrisome to many, this important topic is being thoroughly covered and investigated by our top media outlets. Instead I am going to write about shoes. 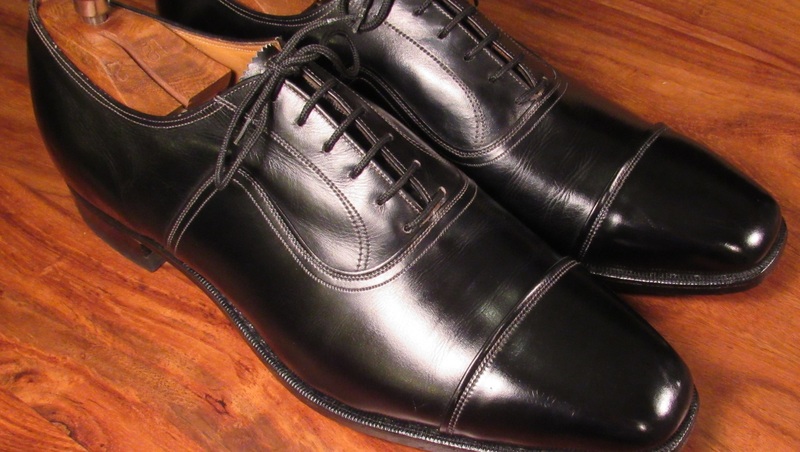 Vintage shoes. 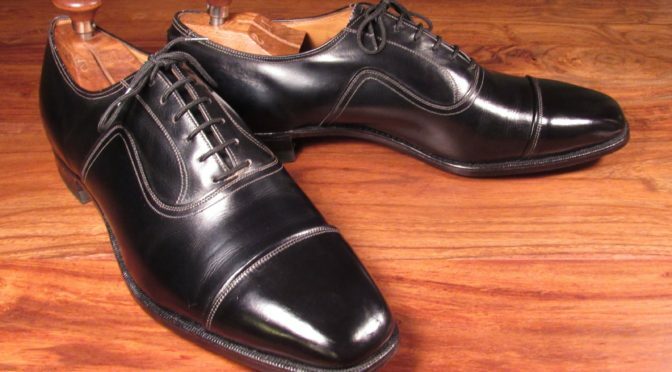 And specifically a pair of Florsheim blue label French toe balmorals, model number 20305. 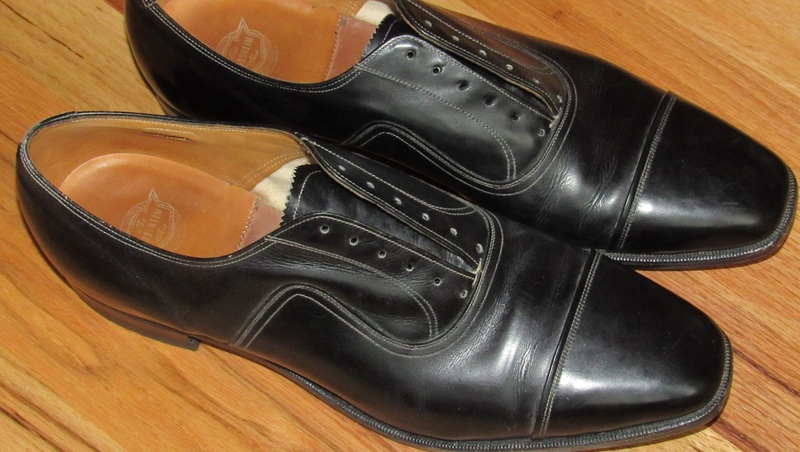 I bought the shoes on eBay. The photos were terrible but the shoe condition was better than expected when I received them. 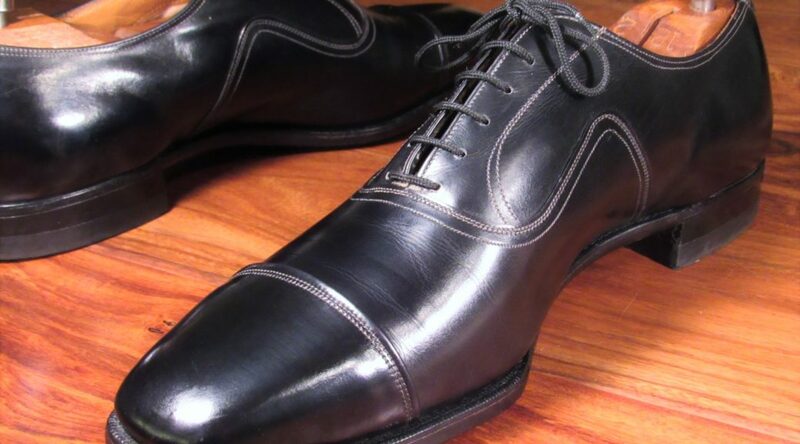 The shoes are very well made and the upper leather is soft and buttery smooth. The sole and heel are original with little wear. 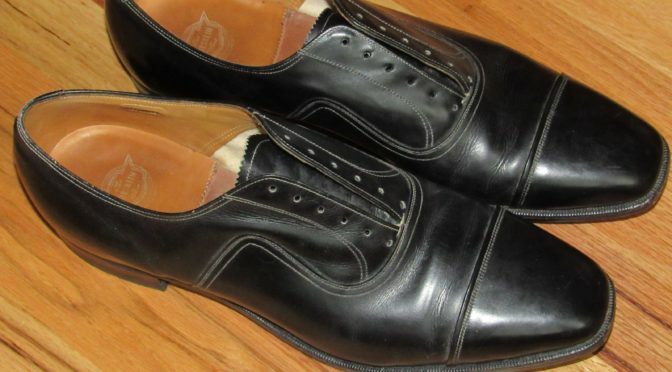 Based on the date code “FI” and construction, this pair was made in 1958 or 1968 but I am guessing 1968. Newer is usually the right answer. 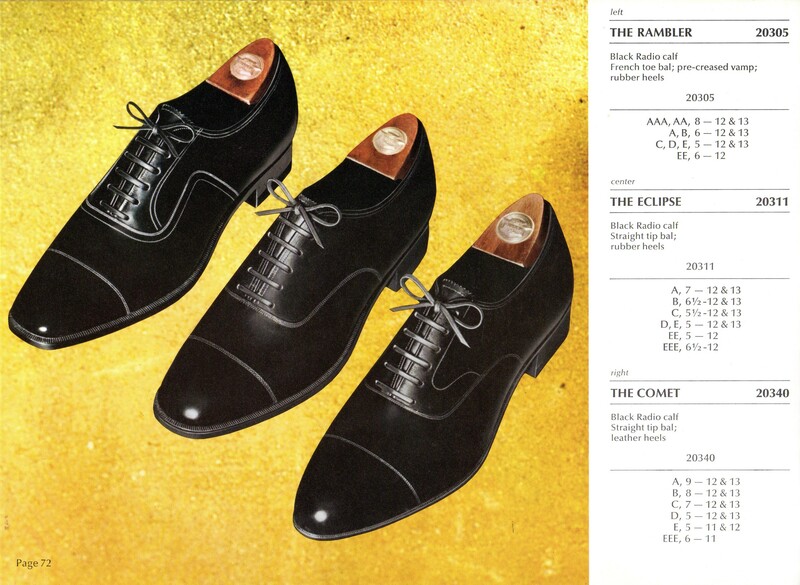 Below is a description of the model from a 1969 Florsheim Catalog. 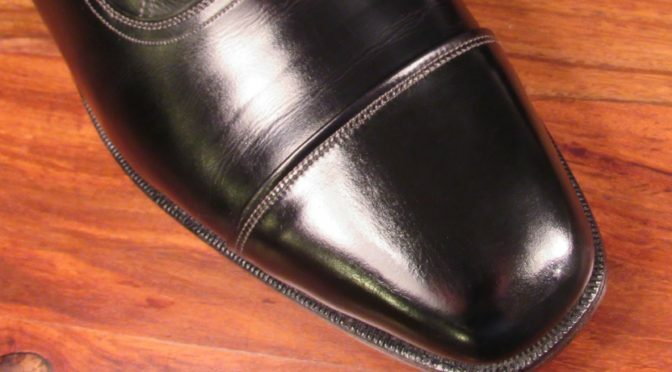 Florsheim listed the style as a French toe balmoral. 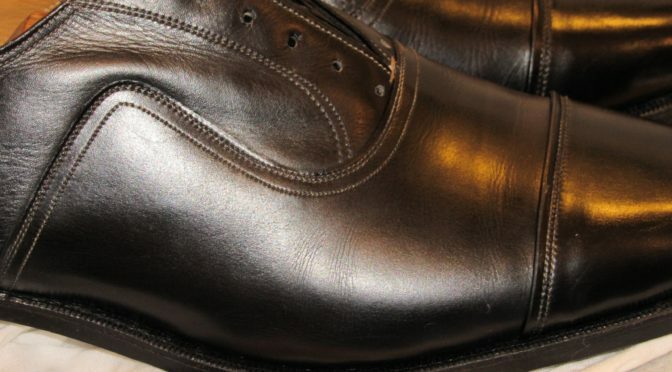 I had thought a French toe was a cap toe with white stitching but I looked up the term on the Google and a number of places listed a French toe as being a square toe. So now I know. 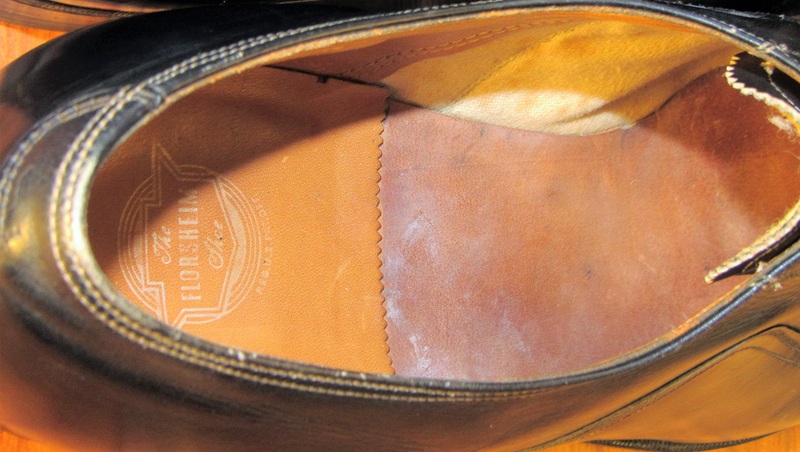 I started restoring the shoe with a good brushing and cleaning with a damp towel. 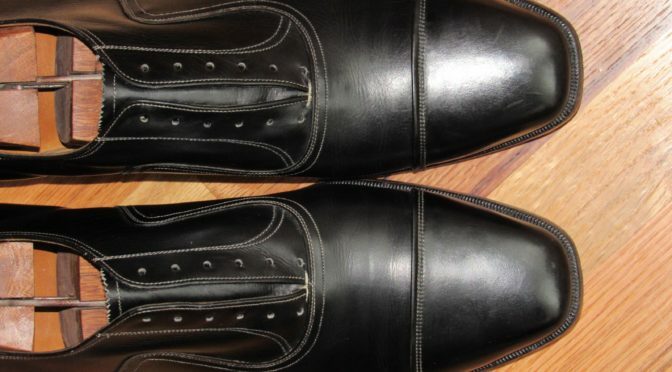 I also used Lexol Leather Cleaner to clean the upper. The shoes hadn’t seen much, if any, polish. The original stitching was still white. For conditioning the pair, I decided to try a glycerin method used by a number of Japanese vintage shoe bloggers. They use a combination glycerin and water to do a deep conditioning of the upper leather. I have a hard time understanding the Google translated pages but I believe they use 1 part glycerin with 2 parts water. 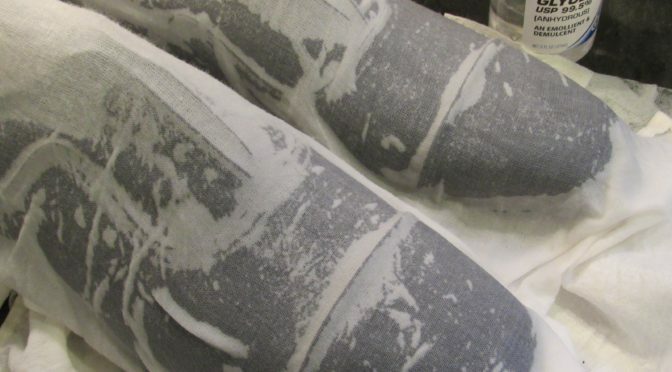 The solution is runny so they use (and I used), a cotton cloth to wrap the shoes and soaked the cloth. I applied about three ounces of conditioner per shoe. I left the solution on the shoes for a few hours. Below are a couple photos after conditioning. 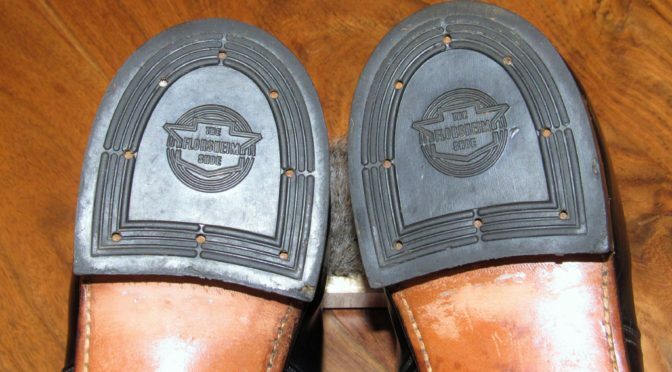 The glycerin was absorbed into the leather and the leather felt cool to the touch. It did appear to lessen some of the creases but that is just my perception. I polished the shoes with a small amount of Allen Edmonds black Premium Shoe Polish and was careful to not get any on the white stitching. Two coats of Collonil 1909 neutral were applied to the toes. 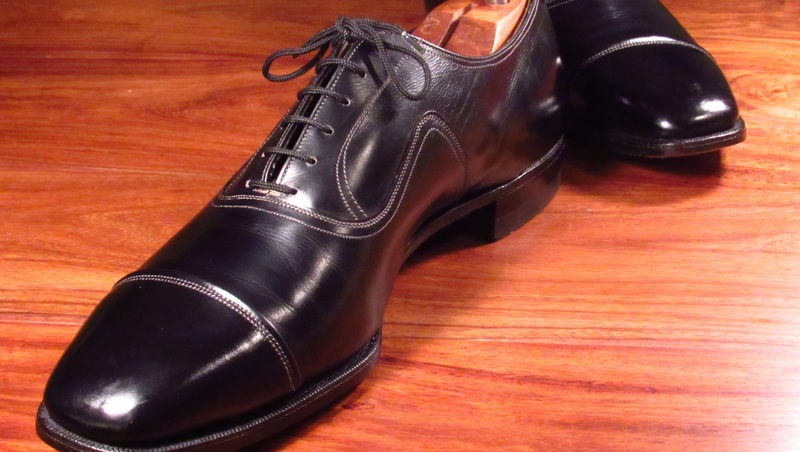 The shoes looked great when done. They look better in person than they appear in these photos. My photographic skills are suspect. One major (and disappointing), issue with the shoes is that they are a size too big for me. 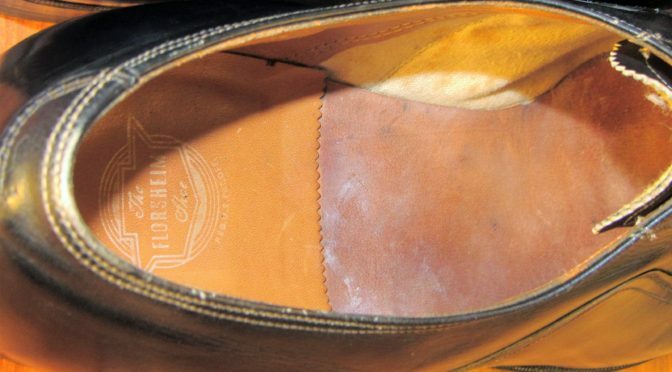 When I bought them, the seller listed as my size but apparently didn’t bother to use the size listed on the inside of the shoes. Frustrating but this is a hazard of eBay. I decided to fix them up for resale. Its fun reviving shoes. 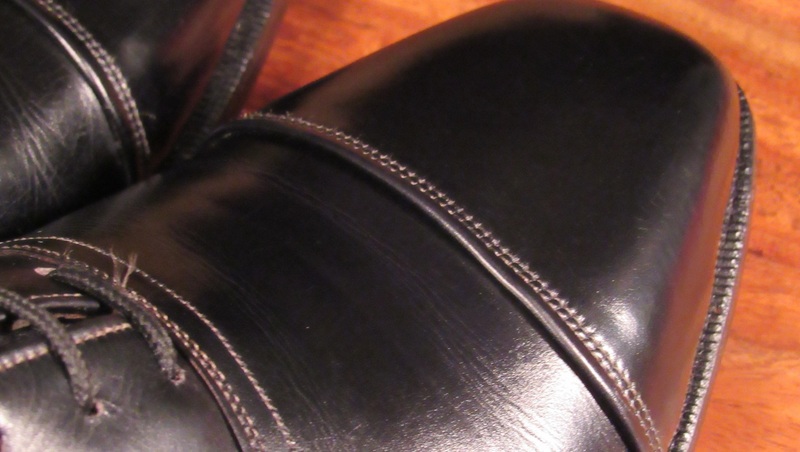 Below are additional photos of the finished shoes. Those shoes look great. They’re pretty unique in terms of style. I’d love a pair like that in my size. Awesome job on the restoration. I really enjoy your site. These shoes do look awesome! Would’ve loved to see more pics of the sole and waist. Also, what does “pre-creased vamp” means more specifically? Says it about this model in the catalog. Thanks. I have never been that happy with the photos on this pair but when its sunnier in Seattle I may take a few more. I assume Florsheim precreased the new shoes for this model. Its an unusual marketing feature.